The File Uploader is a highly customizable widget that adapts to your flows and layouts. By the way, every file uploaded via Uploadcare gets instantly cached on our CDN and swiftly and reliably delivered across 130+ countries. In this guide, we are going to create a form that collects speaker candidate data before some conference. 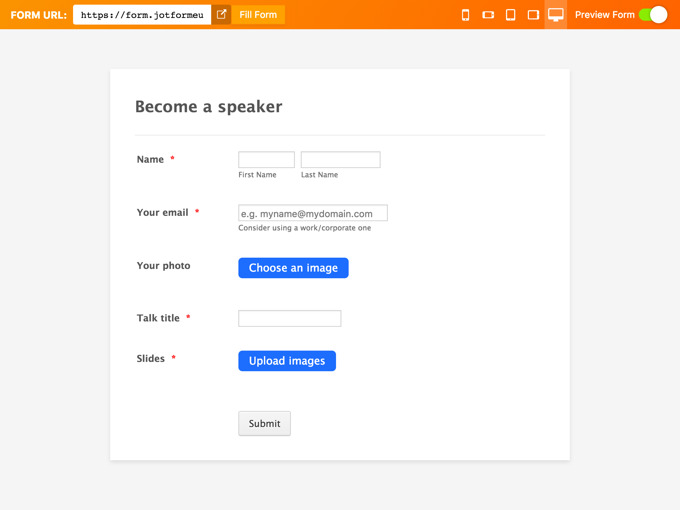 We will use a combination of JotForm fields and two widgets. 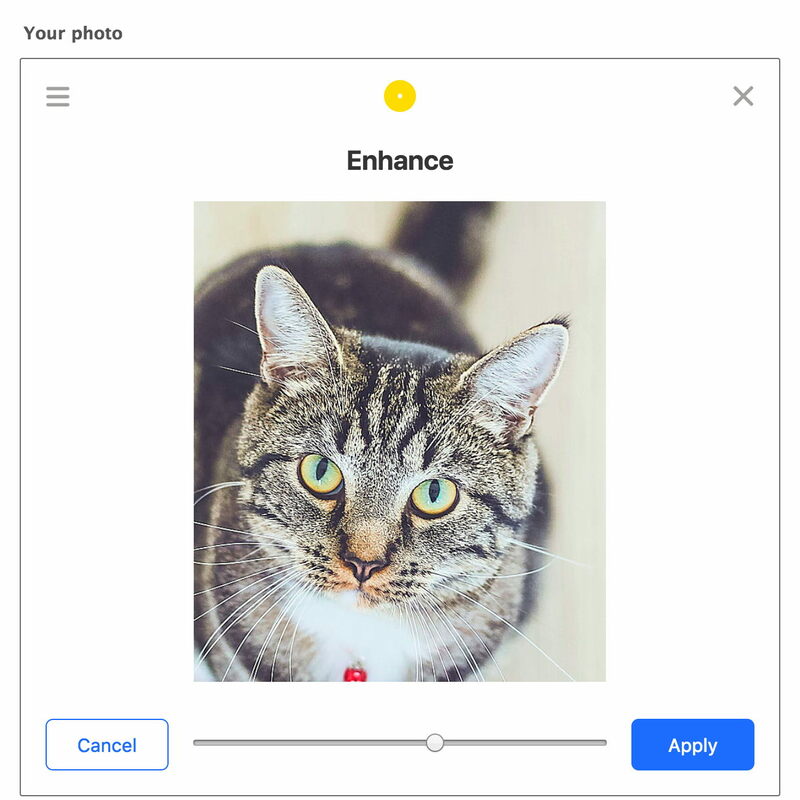 The first one deals with uploading a candidate photo and making some edits, and the second one will be up to collecting slides for a presentation. It should take you about 17 minutes to build a form like that using our File Uploader integration. You will need to define a Public API Key in the File Uploader settings to set a project your files will go to. So, navigate to your dashboard and create a new project or discover a Public API Key for an existing one. The step is about creating a form. If you aren’t registered with JotForm, please look through the FAQ and sign up on the JotForm’s main page. Once you’re in JotForm, navigate to the my forms tab. 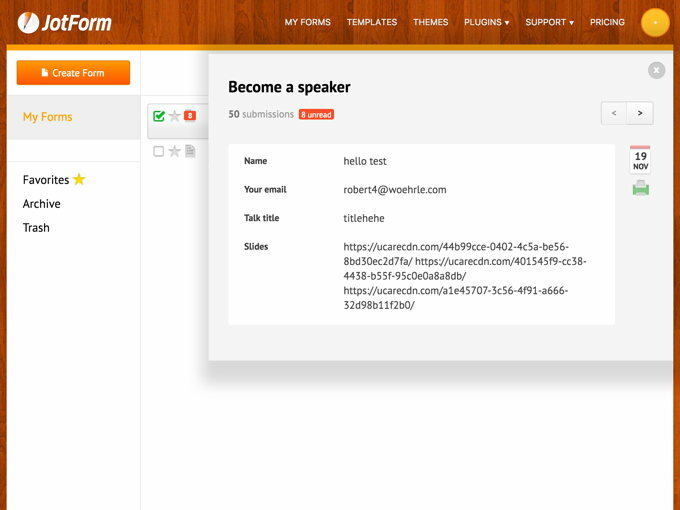 The tab holds all the forms you’ve ever created with JotForm. You can see our form is there and named “Become a speaker.” Let’s see what’s inside by checking a box to the left of the form title. Hit “Edit Form,” and you are in. 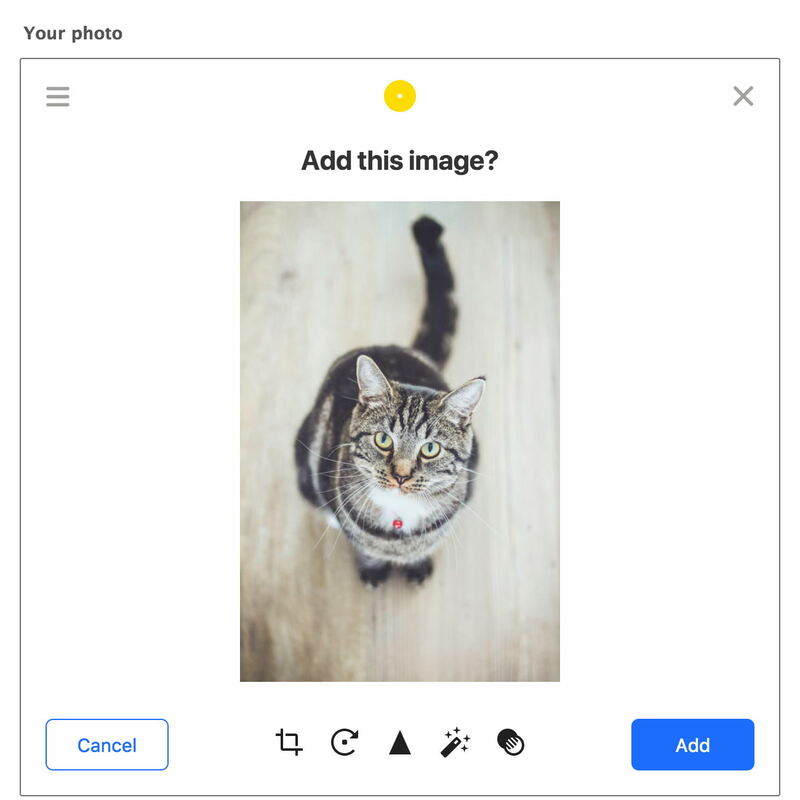 As you can see, there are two buttons for uploading files: one is called “Choose an image” and another “Upload images.” Here’s how you add those. 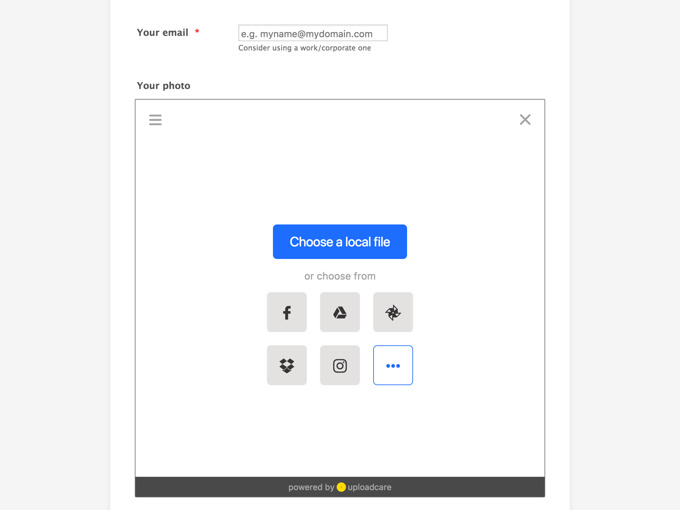 Here it is, hit the yellow logo, and our widget gets added to your form. It is added with default settings and needs some configuration. Now, let us get more advanced and click the magic wand icon to the right. That opens the widget settings, let’s dig in. First of, let’s paste your Public API Key into the respective field. We are using YOUR_PUBLIC_KEY as a placeholder. By default, the plugin removes the original trailing filename from the URL. add filenames provides the opposite behavior and leaves your filename in place. This could be useful when passing URLs to a third-party system for further processing, for instance. 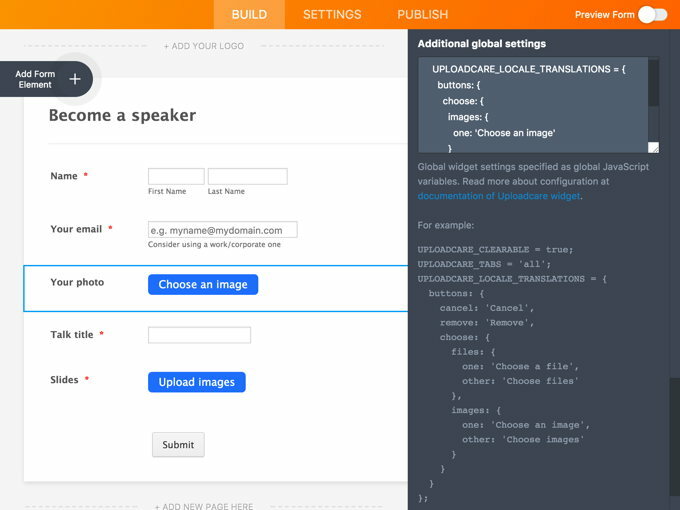 You can also add a set of Image Transformations to a CDN URL automatically. custom string would be the field holding a string to further append to your CDN URLs. Last but not least, you might want to change the button caption. That is done by modifying “Additional global settings.” We added a simple example of what you can do with those. See the complete list of widget settings at the File Uploader Options docs page. Now, add another widget and configure it to accept multi uploads of image-only files. Play with changing its label and button caption. 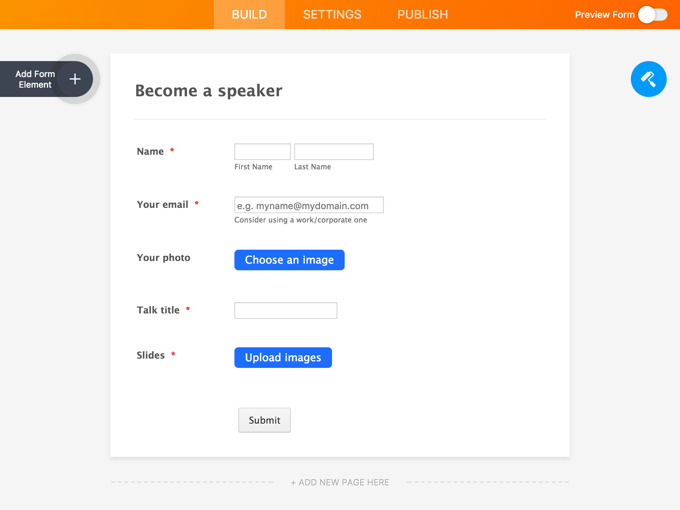 It will allow form users to upload slides for their presentation. In fact, you might want to create a separate Uploadcare project (and specify another Public API Key for the second widget) to get those slides: this helps organize content in your account. Now, once we are ready to roll, let’s publish the form and test how it performs. Get back to “My Forms” and click the sheet icon to the left of your form title. This will open a list of your form submissions. You can navigate through those by clicking arrows in the top-right. Note, files uploaded by form users become either a single URL for an avatar photo or a list of those for slides. Those are your file permalinks. You do not need to have any storage for uploaded files: just put those links in your database. Check out this article to learn more about how those URLs are made and what they mean. If you have any questions, ask those in our Community Area.